Sizing Your Unity Band Is Simple. One of the easiest things you will ever do is learn how to size a paracord bracelet. With this quick guide you will be on your way to finding the perfect size for your Unity Band. Click Here If You Just Want To See The Sizing Chart. 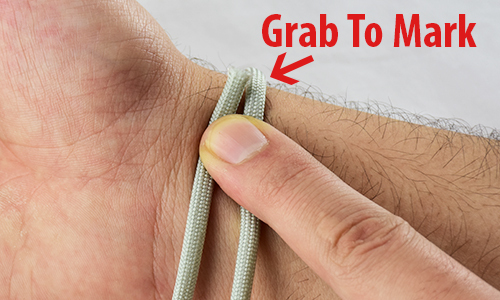 Now that you have everything you need, it’s time to learn how to size a paracord bracelet! Here are 3 simple steps on how to size a paracord bracelet. The first thing you do is take your rope, and wrap it around your wrist until it meets itself. When your rope meets itself grab the rope in that location. This measurement is your wrist size… Super Easy! Now that you have your wrist size, let’s find out what size Unity Band you should order! A Unity Band paracord bracelet can be ordered in 4 different sizes, with custom sizes available upon request (prices may vary on custom sizes). Depending on how you like your bracelet to fit, will depend on which Unity Band size you should order, below is a chart on which size to order depending on your wrist size, and how tight you like your bracelet. A good rule of thumb to go by when ordering your Unity Band is to always order bigger. If you get your Unity Band, and it is to big you can always shorten the size by lowering the button. If you order a Unity Band that is to small than you will either be giving it away as a gift, or sending it back for the correct size. Which means you have to wait even longer for your awesome Unity Band. Have questions about how to size a paracord bracelet? Contact us and we will respond to you as soon as possible!